The former U21 boss takes over from Sam Allardyce after acting as caretaker boss since September. 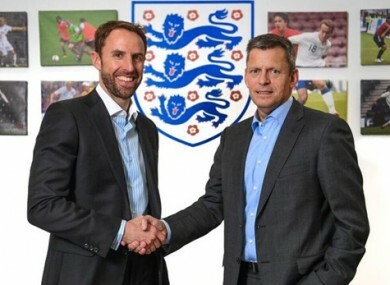 Southgate with FA CEO Martin Glenn. GARETH SOUTHGATE HAS this afternoon been officially handed the England job on a permanent basis. The 46-year-old has been in charge in an interim role since the sacking of Sam Allardyce back in September after just 67 days at the helm. Former England and Middlesbrough defender Southgate led the Three Lions to wins over Malta and Scotland as well as a 0-0 draw with Slovenia to leave them top of World Cup qualifying Group F.
They also drew with Spain in a friendly at Wembley Stadium earlier this month. With no other genuine candidates in the running, the news had been expected for some time and Southgate reportedly met with FA officials on Monday. And in a statement released today, it was finally confirmed that he has agreed a four-year deal, which will take in the 2018 World Cup and 2020 European Championships. “I am extremely proud to be appointed England manager,” said Southgate. “However, I’m also conscious that getting the job is one thing, now I want to do the job successfully. FA CEO Martin Glenn added: “We are delighted to confirm Gareth as England manager. He’s obviously somebody we know well but it’s his understanding of international football and the development set-up at St George’s Park that is important. He performed extremely well during the four games he was in temporary charge and he impressed us during a tough interview process. England’s next fixtures see them face world champions Germany in a friendly on 22 March before their home qualifier against Lithuania four days later. Email “Southgate finally named as England's permanent manager on a 4-year deal”. Feedback on “Southgate finally named as England's permanent manager on a 4-year deal”.